The Community Foundation of the Gunnison Valley meets National Standards for operational quality, donor service and accountability in the community foundation sector. The National Standards Seal by our name indicates official confirmation from the Council on Foundations that we have met the most rigorous standards in philanthropy. This seal confirms that our commitment to financial security, transparency and accountability. It says our grantmaking includes an open, competitive process designed to address the changing needs of our community. The National Standards for U.S. Community Foundations Program was established in 2000 in cooperation with the Council on Foundations. National Standards guide community foundations in establishing legal, ethical and effective operational practices that serve as blueprints for internal development and benchmarks for external assessment. National Standards require CFGV to document its policies in donor services, investment management, grantmaking and administration. To receive confirmation of National Standards compliance, CFGV submitted its organizational and financial policies and procedures to a rigorous peer review. The dollars set aside for charity in the Gunnison Valley are precious. The institutions that donors choose to support must be credible and trustworthy. 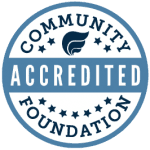 As a symbol of excellence and rigor, the National Standards Seal helps philanthropists and their professional advisers recognize and choose CFGV as a sound place to give and make a difference. The Community Foundation is honored to be among those Foundations approved to use the seal.